Do You Know What Are You Eating? Don’t you wonder what the something is? I know I do! 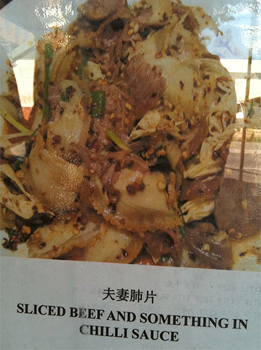 If you look closely at the ‘delicious’ picture from this restaurant you can see a lot of things that might be added to the beef in addition to the Chilli Sauce. So far I can see tiny pulse like things that I think are maggots. Something green which is obviously the famous ‘green thing’ that is in all Chinese meals in China but banned from Chinese takeaways in the West. Is that the edge of an Octopus’s arm towards the bottom in the middle I think so don’t you? Definitely there is a bit of vomit on the left of the picture and I have a feeling that the whole thing turned and started looking at me with the look of a bully in a fairground who asks “what are you looking at?’ To which the answer always sadly seems to be a beating at best or death at worst. One thing I do know is that I love Chinese food, but not enough to eat Sliced Beef and Something in Chilli Sauce that’s for sure! The Cat is one of the most successful feline authors in the history of Cat kind, his sharp elegant wit has produced the bestselling book ‘Getting out – Excerpts from a Cat’s Diary’ and of course the much plagiarised gag of the same name which appears on all of the funniest joke sites on the internet.